CHICAGO, IL – This afternoon, Illinois Governor Bruce Rauner delivered the annual State of the State address. He began today’s speech by referencing Jane Addams as one of the noteworthy Illinoisans upon whose shoulders we stand as we look to build a better future for our state. As the mother of social work, Addams worked to empower people and connect them with what they needed to live their best lives. In staying true to her legacy, it is incumbent upon our leaders that they do the same by ensuring access to community-based healthcare and human services that equip Illinoisans to live well and prosper. To end a terribly destructive budget impasse, last year lawmakers from both parties came together and voted to restore the state income tax rate. This move has allowed the State to begin collecting revenue that is sorely needed to pay for public services, including mental health and substance use treatment, as well as to pay the billions of dollars owed to organizations who provide these services to the community. As the State begins to turn the page on a challenging chapter, now is not the time to reverse course and strip resources from the vital programs and services. In fact, the restoration of the income tax rate to 2014 levels still does not address the State’s structural deficit. Illinois must still find a way to make the necessary investments in the services residents want and need, including public education, healthcare, and human services. We commend the Governor for reiterating his commitment to reducing opioid overdose deaths and for the initial steps that his administration has taken to address an epidemic that has gripped our state and the nation. However, Illinois cannot battle one of the most pressing public health crises in a generation without expanding access to substance use treatment. Adequately and sustainably funding community-based services, preserving the Affordable Care Act and Medicaid expansion, and protecting against barriers to healthcare like Medicaid work requirements are foundational to ensuring access to much needed care. Prioritizing policies like these will help the Governor make good on his goal of preventing opioids from tragically claiming even more lives. Governor Rauner called on his counterparts in Springfield to work across party lines to tackle some of Illinois’ biggest challenges. 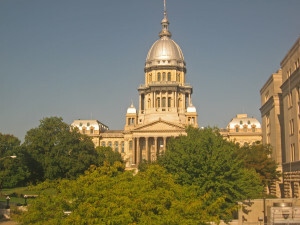 We echo the Governor’s call for state leaders to come together and do the tough work of rebuilding our state – including making the appropriate investments in critical services that allow Illinoisans to stay healthy and thrive. This entry was posted in News and tagged advocacy, behavioral health, governor rauner, healthcare, Illinois, mental health, press release, public policy, statement. Bookmark the permalink.